Wetherspoon’s really seem to be upping their game in terms of their beer offer, with lots of exciting stuff going on, including their excellent American cask beer collaborations and widening of their bottled beer range to include some more craft brands such as Goose Island and Brooklyn Lager. I ‘ve tried quite a few of the American cask beers and on the whole been very impressed - the version of Stone’s Sublimely Self Righteous Black IPA and then Jack D’or Saison being particular highlights. 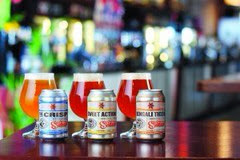 The latest announcement is that the truly excellent Sixpoint brewery from Brooklyn, New York are going to be exclusively supplying Wetherspoons pubs with three canned beers: ‘The Crisp’, which is a pilsner, ‘Sweet Action’, which is a sort of cream ale, and ‘Bengal Tiger’, which is an American IPA. They’ll available in all 900 JD Wetherspoon pubs from next month. The cans are diddy little 355ml ones which have been produced exclusively for Wetherspoon's – if you buy these beers in the US they come in larger 16oz cans – which I imagine is a combination of the beers’ strength (Bengali Tiger is 6.7%) and the fact the larger cans would demand a price out of line with what people expect in a Wetherspoons. It seems like a sensible move, and the little cans look really cool to boot. I’ve tried all three of the beers before over in New York, and trust me, you’ll want to try them too. You can read what I thought of Bengali Tiger and Sweet Action here (I didn’t bring a can of The Crisp back for review due to lack of space in suitcase). Spoiler Alert: contains gushing. These beers have never been available in the UK before to my knowledge – not even through specialist online retailers – so this really is quite a coup for Wetherspoons. Spoons pricing may give some pricey "craft" bars a much need kick up the jacksey too!